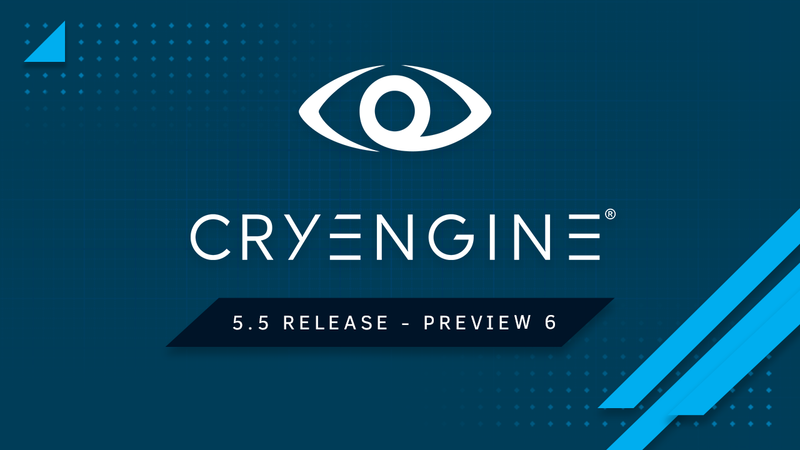 CRYENGINE 5.5 Preview 6 is available now through CRYENGINE launcher and GitHub! As you know, work never stops on the development of the engine, and today’s update pushes things forward with 20+ improvements and some important middleware updates. We couldn’t have put this update together without the help of our community, so as ever, we’d like to thank everyone for all your feedback and suggestions. Keep it coming! CRASH: Vulkan crashes after level load. CRASH: Sandbox Editor crashes if a particle effect is placed in the level and is opened in the Particle Editor. ENTITY: Light Projector does not cast any shadows. ENTITY: Using an entity/component as movement, rotation pivot/joint in Trackview does not play the animation in-game and or in pure game. Updated to Wwise SDK 2018.1.0 (NOTE: If using CRYENGINE 5.5.0 Preview 6 (and future versions of CRYENGINE), then users MUST update their Wwise version to at least version 2018.1.0 or later. NOTE: Earlier versions of CRYENGINE i.e. up to and including CRYENGINE 5.5.0 Preview 5 MUST use a Wwise version that is prior to Wwise 2018.1.0. Updated to Fmod Studio 1.10.07. Fixed: Container Entities do not output correct data. Fixed: GetDebugName platform ifdef - fixed compilation for Durango. Fixed: Pipeline State Object (PSO) pool growing unbounded. Tweaked: Allow recursive release of rendernodes. Fixed: (Entity System) Crash after jumping into any level and trying to exit. Fixed: (Entity System) Unremovable entities were not hidden when they were removed. Fixed: (Renderer) Missing information in water volume reflections. Fixed: (Sandbox Editor) Opening a level through the Asset Browser will set the wrong level path. When saving a level, legacy code in mission, terrain, vegetation etc. will fail to resolve the path. Fixed: (CryDefaultEntities) Assertion and crash in the MannequinObject after deletion. The MannequinObject was changed to an IEntityComponent but still behaved like a GameObject on shutdown. Tweaked: (Animation) Vcloth parameter names have been changed in order to clarify that constraints are enforced and propagated locally between nearest neighbors only. NOTE: Users will need to override defaults and set the values for the new Nearest Neighbor Distance Constraints (NNDC) parameters. Tweaked: (Character Tool) Checkbox for NNDC now switches to disabled after re-loading. Tweaked: (Water Volumes) Added more parameters. Tweaked: (Water Volumes) Improved fade-out parameters to suppress glaring step-artifacts between missing and non-missing Screen Space Reflection(s) (SSR) information. Tweaked: (Sandbox) Don't handle mouse events in Level Editor Viewport if no level is loaded. Tweaked: (Renderer) Move GPU particles update into Update() rather than Execute(). Re: CRYENGINE 5.5 Preview 6 is live! It would be nice if "CryGameSDK.dll" was updated more often for beginners. 1 - when I use meter unit with big unit in terrain in time that I want make a new level in sandbox, after a few load,terrain hidden! 02-I analyzed physics functions with cryphysics library, here is a obstacle and friction issue for mass and rigid type with newton unit for impulse function, I used unity, I don't see this obstacle and friction issue in unity, when enemy shoot bullets to player , bullets come down to the ground with a curve , it is not true! I use this for unity without problem but this problem exist in Cryengine 5.4 and 5.5, also when I use mass=1 or 2-7-8 , bullets fly to sky!!! How are you bullets enemy ? Mass is 1 -2 - to 8 kilo garam (kg or g) , you must fly to down not to fly up to sky!!! Oh my god, when I want use of ENTITY_EVENT_UPDATE in bullets enemy, bullets will be hide just like ghost!!! 03 - look at simulate , I do but when shoot bullets to player , I see offsets distancd of player related to bullets enemy!!! I used this coded for unity, I used without problem in unity but I have problem in Cryengine, what is happened??? It would be great if you can post these bug reports in the issue reporter for GitHub where we can get the reports internally automatically. Please make sure to provide full reproduction steps if you can, it is hard to discern exactly what you mean and are trying to do. Not until 5.5 is officially released.